Throughout her journey towards being wholly herself, 74 year-old trans woman Christine Beynon has been taking selfies all along, a collection of which are the subject of an exhibition that opens in the RHA in Dublin this week. Interviews 4 September, 2018 . Written by Brian Finnegan. Christine isn’t a native of Connaught, as her gentle cockney accent gives away. Born and bred in the East End of London, she spent her childhood and most of her adult years pushing her true identity away. After leaving school she worked in her uncle’s chairmaking factory, before leaving to go into warehousing, and that’s where aged 20 she met Celia, the woman who would become her wife. The couple, along with Christine’s son and a daughter of their own, relocated to Ireland nine years later. For the duration of their long marriage, Celia, or Chris as she was known to family and friends, didn’t know about her husband’s gender identity. “I thought that getting married and being in a straight relationship might make it go away, but it didn’t,” says Christine. “When my wife went shopping or whatever, I took the opportunity to wear her clothes. It was very mild, not fully dressed up or anything. I was always looking around me, wishing I was a woman. “After a while, I had a box of clothes in the attic, and she’d go and visit a neighbour and I’d get them down for ten or 15 minutes, hoping she wouldn’t come back and catch me. I’m sure in a way I wanted to be caught, while at the same time not wanting to be caught. “It made me really secretive within my marriage when I didn’t want to be secretive. I had to watch what I said in case I said something inappropriate that might give me away. I used to go shopping with my wife, but I couldn’t allow myself show interest in the clothes. Chris passed away from breast cancer in 1998, and in the aftermath, Christine was both liberated and crushed. “For the last two weeks of her life, when my wife was in the hospice, I was at home dressed fully as a woman. I’d given up my job to look after her, and I’d done my best by her, but this really affected me for years, that I had been deceiving her. I felt very guilty and I went through a period of bad depression. “After Chris died, the neighbours said they’d be supportive, but they weren’t really. They sort of melted away. That’s the way people are. They say, ‘I’ll give you a ring next week,’ but it never happens. So I became very isolated. There was no help, nowhere to go, nothing to do. Nobody knew about me. As many trans people who haven’t found the courage to access the medical system often do, Christine began to self-medicate with hormones she bought online. She ended up in the Galway Regional Hospital coronary unit after an overdose, where she said nothing to doctors about the hormones she’d been taking. Although Christine has been accepted by the local priest, the daughter she had with Chris has found it difficult. “I told her about myself in 2006, during the bad times, and from that day to this, she’s never come to see me, even though she only lives 20 miles away,” says Christine. “When I was going for my surgery, I called her to let her know. She said, ‘I can’t even say your name’. Over the years, Brighton, and a particular hotel there called Legends has become Christine’s escape from the isolation of country life. The residents of Christine’s village might largely ignore her, but that doesn’t mean she goes unscathed elsewhere in the region. “I get called names, but I ignore it,” she says. “The other day I went for a walk with a trans friend on the promenade at Salthill, and we got a few yards before a couple said, ‘Are those two women, men?’ It made us laugh, it’s a funny comment really. Throughout the years leading up to her transition and beyond, Christine has visually documented herself by taking selfies. 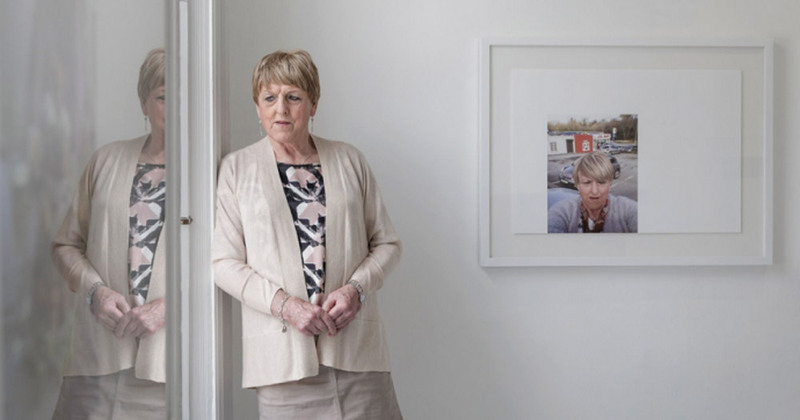 This vast collection of photographs attracted the artist Amanda Dunsmore, who first met Christine in 2012 when was working on a commission for Galway County Council based around the older generation of the LGBT+ community. With Christine’s photographs as a centrepiece, Dunsmore has created an exhibition called Becoming Christine, which opens at the Royal Hibernian Academy this week. “There was nobody to take photos off me, so I had to take them myself,” says Christine. “Amanda had been looking at the selfies on Facebook and she came to me and said she wanted to do a visual show. They’re not selfies as you might think of them, though. “I’ve never said that I would pass, so I got that out of my head, the idea of trying to pass. I’m just being me. I’m trying to be presentable. People often say to me that I’m always well dressed, and I say, ‘I have to be. I have an appearance to keep up’. Becoming Christine’ runs from September 7 to October 21 at the RHA Brown & O’hUiginn Galleries in Dublin, find out more here. 4 September, 2018 . Written by Brian Finnegan.